I was playing around with the pictures from my past trips. I stopped and started at this Red Ibis and decided, why not, let this be the Lazy Sunday Photo. I clicked this picture at the Kuala Lumpur Bird Park, popularly known as KL Bird Park. 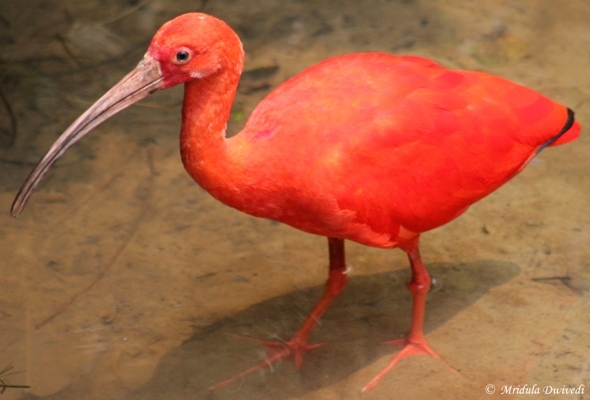 I would love to see the Red Ibis in the wild too! Have a lazy Sunday folks. It was my last stop on my visit to Kuala Lumpur in 2012. Incidentally that was my first invitation abroad and what fun it was. If you are visiting the KL Bird Park here are some tips for you. Keep ample time, there are many areas ans anything less than a half day would be too little. It goes without saying- do not disturb the birds. There is a souvenir shop within the premises, I bought two t-shirts from there. You get taxis right from the entrance of the park. They have an official website, do check it out. The aviary is high enough for the birds to move around, so you do got get bars in your pictures. I would die to see a few of these birds in the wild, they were so exotic. Like everywhere else, you are asked not to feed the birds. Be prepared for a bout of rain anytime. There are shelters in the park but bringing an umbrella is also a good idea. But a few birds are in cages. They are open on all public holidays. They have a cafe, Hornbill but due to lack of time, I could not check it out. Before I leave here is a video of the birds from the park. If I ever head that way, I would visit the park again. I would make an effort to visit the butterfly park too, which I missed out on. Visa on Arrival for Indians in Bhutan Screen Full of Stuff! Beautiful bird and photograph is automatically good. Thanks for sharing. Thank you so much Indrani, it does looks striking! Soooo cutee. It is like a doll. Very well snapped! That doll analogy is cute! Thank you. Just look at that color! Not shy either, this bird – how on earth did you get so close? Or did you use a zoom lens? Kalpana I used a zoom. Thank you so much Abhijit.